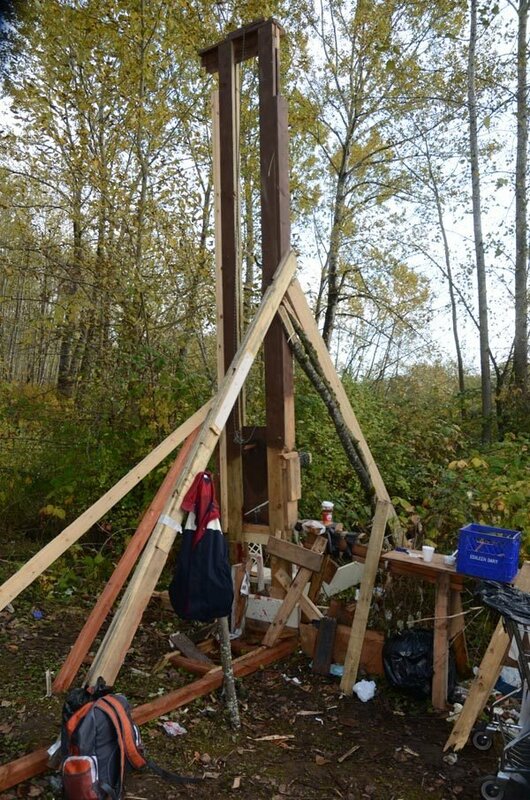 A homeless man in Bellingham, Washington nearly became a nominee for the Darwin Award when the guillotine he was building in a wooded camp "unexpectedly" cut off his arm. At right you can see the photo that police released of the decapitation machine. Feel free to post whatever jokes cross your mind about giving this guy a hand etc. But seriously: why was a homeless man building a guillotine at a campsite? And just look at that thing: it's easily one of the more sophisticated guillotines that I've seen built by a layman. Something like that takes some skills to pull off. As much as I have to wonder about his motive, I have to also wonder why he wasn't putting that kind of ability to work in carpentry or metalwork.